I took the left overs from the lentil and fresh produce adventure of the other day and combined it with tomato and roasted red pepper soup, with more zatar and black pepper. I also had left over macaroni which had been tossed with peas, blush peppers, kalamata, shallots and black pepper. So I boiled up some basic lentils until they were mostly done, and then tossed in large diced tomatoes, large diced beans, salt, zatar and black pepper. Once done, toss with the left over pasta. Why do I keep saying toss? Anyway, this was brilliant tasty, and Friday vegan for the win. One downside with participating in a community garden and having a plot in that garden is that when produce comes in, produce comes in. Suddenly your house is full of bush beans, pole beans, radishes, tomatoes, cucumbers, fresh herbs, bell peppers and hot peppers, and I mean full, all at the same time. I am a culinary spell caster who neither grew up in, nor received his training, nor has spent very much time at all for that matter, in what gardening people call “Zone 9a” but that is where I find myself at the moment. So rather than this avalanche of product happening in July or August, it has been happening for about the past month. I have literally sat at my laptop munching a cucumber I just pulled out of my garden while reading tweets from friends complaining about snow. This is deeply confusing if you aren’t actually a Southerner. I am also not a seasoned (ha ha) green thumb. My Mom kept gardens when I was a kid, but as with most things I now enjoy, at the time I found it boring. So in some regards, I am winging it during this, my first season. Thankfully I am tag-teaming on my plot with another couple who have at least one year’s experience already in the bag. For reasons I don’t entirely understand, my habanero hot peppers are coming in long since full grown, but are not changing color from dark green to anything close to orange. Recently I gave up and harvested a big bunch of them (about 40) that seemed to be about as big as one could expect them to get, but which were still quite green. I also have piles of tomatoes. Sadly, not piles of Roma tomatoes just yet, they seem to be taking their time coming in, but piles of grape, cherry, some Roma and some of the more generic round ones I don’t know the particulars on. So in an effort to get some stuff used up, I decided to make a batch of arrabbiata. Let me just say in passing that gutting grape and cherry tomatoes is incredibly tedious. People think spell casting is all glamorous fireballs and healing effects and illusions. Nobody stops to think about the finger grinding, brain numbing work of preparing physical components. Chefs get the glory, wait staff get the tips, but the morning vegetable crew does all the real work. Believe. I started with 3 peppers thinking this was conservative and I could add more to bump up the heat. What I ended up doing was adding two cans of tomato paste in an effort to cool the results down, and we still had to eat dinner with handkerchiefs in hand when served over pasta without cheese (dairy buffers this kind of heat). That being said, a dollop of it over roast beef, stuck under the broiler on slices of sourdough made for a truly sensational lunch. Today I will be adding another 30 or so tomatoes to continue tempering the heat. I also plan to take all the peppers that have stems and string them to dry, since I now know that using them up is going to take FOREVER. Meanwhile, if any orcs attack, I’m just going to spoon this stuff into clay jars and throw it. Inspiration! I need a quest to raise my inspiration level. I think I have been hit by a vampire and suffered a level drain lately. I have been following Kitchen Incantations from others … TO THE LETTER, nonetheless. I have also been afflicted by a Curse of Habit by which I am repeating these routines. These incantations, now bordering on alchemic mumbles. Variety is crucial, beyond essential, to the Kreative Kitchen Kleric. In following my recent vegan experiment, I learned the real meaning of “variety is the spice of life” as I failed to employ variety. As a result, I managed to make myself tired of things that I normally like. But for some of this I have been following recipes that are supposed to be quick-and-easy — something that has become important to me as I balance evening meals with a commute home. (So, what’s my excuse on the weekends… another story, perhaps.) Last night I ended up at least putting some experience to use to correct something I could see was going to go horribly wrong. The idea was that a whole chicken gets cut up into “serving sizes” and then satueed. Once prepared (simply salted & a bit of pepper) and in the pans, I could tell the breasts were going to give me the usual trouble: bone-in-breast means raw meat on the bone. I have tried cooking these several ways with the same result. The only way I have found to cook bone-in-breast chicken is in the oven or on the grill with lower heat. My theory is that my stove-top area isn’t really a good place to get the heat to permeate the meat well enough to cook all the way through, even with a cover. After cutting up the whole chicken, I salted and peppered it. I used two skillets (per the recipe so that none of the parts were touching) and cooked them on high heat, skin-side first, for a short bit to crisp them. I salted/peppered the up-side while the skin side was cooking. I then flipped them and crisped the other side. This is when I noticed the breast-meat swelling and, as is my experience, threatening not to cook. Therefore I summoned an Oven of 350F. I added a little minced garlic and some paprika, covered the skillets with oven-proof covers*, and tossed them into the oven for 15 minutes. All came out well — juicy and tender. It wasn’t according to the recipe, but it worked. It works for steaks, and it works for chicken. *This is quite simple in my case as I use cast-iron. One of the pans has a cover that goes with it, the other I know of a kettle cover I can use that is oven-proof. I have said it before, and I will say it again after this: I am not a vegetarian, let alone a vegan. I have said it before, and I will say it again afte this: I am a huge snob when it comes to food and drinks. Amusingly, this latter point crops up in some not so snobby ways, like “what is the best pizza” or “what is the best cheeseburger” not just “what is the best 18 year single malt scotch”. What it means in the upshot is that I have strong opinions both on how to correctly define various food terms, and on what the near Platonic actualization of that term then may be — whether you want them or not. Being from New Jersey, and thus wedged between that holy junkfood trinity of Philadelphia, New York City and The Jersey Shore , I have especially strong views on the word “pizza”. A strong case can be made that of all the styles of pizza to be found throughout the United States, “New York style” is the closest to the Neapolitan original (yes, pizza is really a genuinely Italian food, believe it or not), and since this is the style one generally finds throughout the heavily Italian immigrant populated regions around the holy junkfood trinity, most notably the highly lauded “boardwalk pizza” of the Jersey Shore, those of us who grew up eating this style have a tendency to insist that this is “pizza” and that all else is at best inferior and at worst (like Chicago style) not pizza at all. 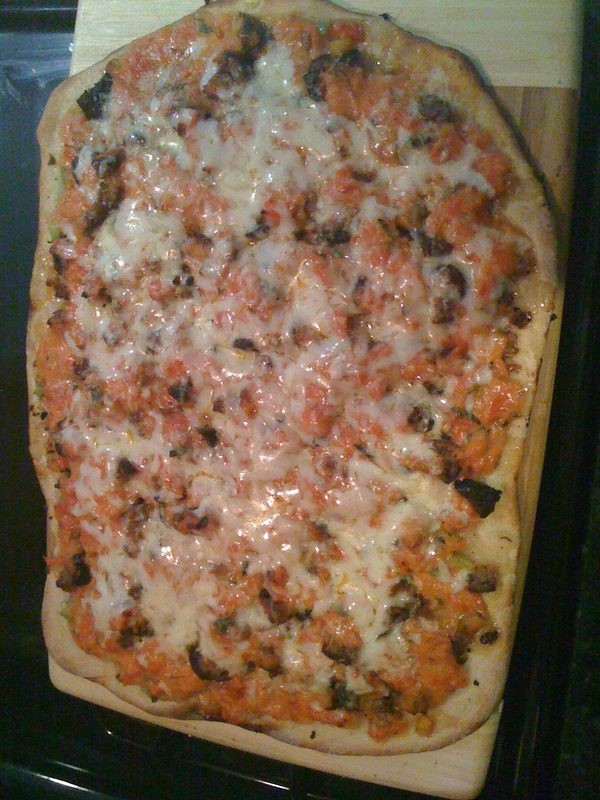 I say all this, and mention once again in passing that I am not a vegetarian/vegan because I am about to discuss something we cooked the other evening for dinner, and I am going to very deliberately not call it a pizza. While it did involve a traditional dough (purchased in a small, frozen ball from the grocer), fresh tomatoes, fresh basil, fresh oregano, fresh “blushing beauty” bell peppers, and was cooked in a rocket hot oven on top of ceramic tiles, it did not have any cheese on it. None. And because of this, it was not a pizza. So call it a veggie flatbread. And we had it on a whim, mostly. It wasn’t a fasting day in the Church cycle that required us to skip the cheese, we aren’t deliberately watching our dairy fat intake or anything like that. We just tried this to see how it would be. In addition to the already mentioned items, all from my organice community garden plot, we also caramelized a red onion. My primary concern was whether or not the veggies would stick to the dough without cheese. They did. Mostly. If I had rendered the tomatoes more into sauce, it is very likely this would have bound everything to each other, and the dough. Tonight we are making another attempt, this time with a chunky sauce of fresh tomato and oregano, faux sausage crumble, black olives, and cheese. In other words, we’re making pizza. The really important thing here, when you have your oven up to 550 degrees and you’re cooking directly on ceramic tiles, is to actually sit and watch the thing cook after the first 10 minutes or so. I used a timer to do 10 minutes, and then a second timer to do an additional 5, which was about 2-3 minutes too long. Much of the crust without toppings on it was burnt. Thankfully, the crust was overwhelmed with toppings, so the loss was minimal. My plan tonight is to do the first ten minutes, add the cheese, then watch from there rather than using timers. Please note that the cast of the TV show of that name are not from New Jersey. Most are from New York, at least one is from Rhode Island, and in any case, the entire show is set in a location that residents of New Jersey universally despise precisely because people like that from New York have completely overrun the place. When a resident of New Jersey says “the Shore” they are more likely to mean Wildwood, Ocean City, Atlantic City &c. rather than Seaside Heights. There is a local, Lebanese bakery which provides a variety of pita breads to all the local Whole Foods locations in Houston. I made this connection a year ago when I went directly to the bakery to get falafel sandwiches (during Lent). Today, we learned that their “mountain bread” is fit for the apetite of a Hobbit! Once we got them unfolded, the diameter was easily 18 inches, if not 24. We had opted for the mountain bread because we wanted to make some wraps for dinner, and had figured that the pita, pocket style bread would be too thick as is, and would fall apart if opened up. So, apparently we were in for some serious wraps. I quartered an eggplant (a longer, thinner variety than the typical Italian, but not as long and thin as the Japanese styles) and then sliced it into roughly half inch wide bits. I salted it and cooked it with jalapenos, onion (received in trade from a fellow gardener for some of my extra radishes), a pale green bell pepper (from my plot) and roasted garlic. Once well along, this skillet was put into a 400 degree oven next to a second one containing olive oil and some pre-made falafel (from a bulk warehouse store and which is distressingly good) for about 30 minutes, give or take. The enormous bread was laid flat. Ruffled lettuce (from the garden) was arranged in the center along with some shredded cheese. The falafel was squashed to help the whole thing wrap up, and then it was topped with the roasted vegetables. The whole universe was then rolled up snug. This was a much, much better success than the pickles.